The story of Noah is told is chiastic parallelism (or chiasmus), a figure of speech in which the order of the terms in the first of two parallel clauses is reversed in the second. If you assign the letters A and B to the first appearance of the key words or phrases and A’ and B’ to their subsequent appearance, they follow what is commonly referred to as an A-B-B-A pattern. After this literary point, Carter lists eight other facts about Noah, the Ark, the animals, and the Bible. To his nine, let me add two more theological considerations. First, in addition to being the Bible’s first drunk (Carter’s #6), Noah was (after Adam) the first priest in the Bible. Or at least, that’s what I argued in my dissertation (pp. 66-71). He represented his family, mediated a covenant, offered sacrifices, and pronounced a blessing and curse upon his children—all things that priests did. Accordingly, though we often miss it, Noah functioned as a priestly-kind of savior. 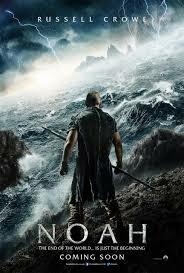 The film entirely misses the covenantal structure of the Noah story. In the text, God clearly sets his love upon Noah as an expression of grace. Through Noah, a righteous man, the entire family is saved. Never is there any hint in the Bible that Noah or those he loved were ever in jeopardy. Surely this is a picture of the good news. Even in the harsh, hyper-realized biblical world Aronofsky depicts, through a miracle, those upon whom God set his love were never meant any harm. This is a message we need to hear too. The Genesis text begins and ends with God’s covenantal promises to Noah. Through Noah then, all of the earth was to be blessed (Gen. 9:12). This point is further underscored by the author of Hebrews: “In reverent fear, he constructed an ark for the saving of his household. By this he condemned the world and became an heir of the righteousness that comes by faith” (Heb. 11:7). Exploring the theme of God’s justice and mercy, if pursued apart form the notion of covenant, is a risky proposition with unreliable theological results. In total, there are far more than eleven things to know about Noah, but Joe Carter’s nine and my two–Noah’s priesthood and his role in covenantal history are a start to knowing more about this figure who looms large in the biblical canon, and who foreshadows the greatest hero of all—Jesus Christ.